Not to be confused with Kaupang. Kaupanger is a village situated along the northern shore of the Sognefjorden in the municipality of Sogndal in Sogn og Fjordane county, Norway. It sits along the Norwegian National Road 5, about 12 kilometres (7.5 mi) southeast of the municipal centre of Sogndalsfjøra and about 8 kilometres (5.0 mi) northeast of the Sogndal Airport, Haukåsen. Kaupanger IL is a sports club located in Kaupanger. The 0.87-square-kilometre (210-acre) village has a population (2013) of 931, giving the village a population density of 1,135 inhabitants per square kilometre (2,940/sq mi). Kaupanger originated as a settlement during the Viking age. 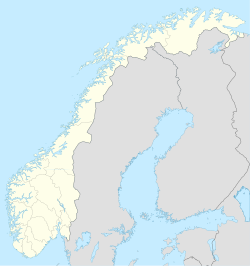 Earlier, Kaupanger was known as Tingstad. Kaupang is an Old Norse term for a trading or market place so the village's name is composed of kaup- (buy) and angr (fjord, harbor), hence "buy harbor", similar to the literal translation of Copenhagen. The Kaupanger Stave Church is believed to have been built in the 12th century and it is still in existence in this village. ^ "Kaupanger" (in Norwegian). yr.no. Retrieved 2010-09-04. ^ Store norske leksikon. "Kaupanger. – tettsted" (in Norwegian). Retrieved 2010-09-04. This page was last edited on 16 August 2018, at 14:28 (UTC).